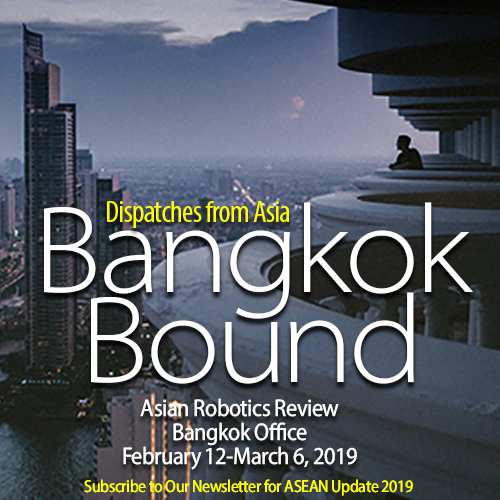 Asian Robotics Review will be in our Bangkok office February 12-March 6, 2019. Get on our mailing list to get your free copy of ASEAN Update 2019. Subscribe today! Korea’s good buddy is Vietnam; Japan is reaffirming itself in Thailand and with the Mekong5; East Asia and Singapore are designing a future for Myanmar; Indonesia is a 250-million-person enigma…still; Malaysia, with its new leadership, is readying for its next big step up in automation; the Philippines is waffling with indecision…still; and China is building the land, sea and air trading infrastructure that will bind it all together. For example, Samsung’s investment of $2.5 billion in its Vietnamese factories elevated the country’s per capita GDP by 1.2 percent; or bond buying by Japan’s central bank has left the country flush with cash to spend, which is finding its way to Thailand.